Subscribe to comments with RSS or TrackBack to 'Turner good, Romero bad, Treinen ugh'. There’s no dispute that Turner pitched better than Guthrie, but I don’t really think he pitched well. There were a number of crushed balls that ended up caught – MAT made a great play on one, another was right at Eaton, and another right at Zim. In an alternate universe, Turner threw the exact same pitches in the exact same spot and gave up 6 runs. Treinen was both bad and unlucky. At least 3 of those 6 hits were not well struck, but of course that leaves the other 3 that were. And the fact that he doesn’t strike a lot of people out makes him vulnerable. Right now he’s sporting a ridiculous .517 BABIP, which is going to come back to earth. He needs to get the BBs under control too. I’d prefer to see him in mop up duty going forward, and for the team to use Glover-Kelley-Blanton as the A-team bullpen. Great point about Treinen’s babip. Turner’s on the night was .294 … or right about league average. I wonder if a bad inning like last night isn’t enough to put him on the mental D/L though. The best news is that Turner is 25, not turning 26 until next month. He’s only seven months older than Cole, who we still sorta think of as a “prospect.” (Sorta.) Also, FWIW, Turner is a Boras client. FWIW, Turner was a 1/9 draft pick and was a consensus top 25 prospect when he came up. The Nats are his sixth organization. With his AFL time last year, Voth is stretched out to where he could go 200 innings. The organization doesn’t seem to have any particular love for him, but they may have to turn to him sooner or later. Incidentally, assuming a 20-25% buildup per year, Ross won’t be able to go ~200 innings until 2019. Treinen is the definition of The Peter Principle. Pronmote him to a job his skills aren’t suited for, then he crumbles in confidence and performance in all positions. He was in his perfect position last year. When men are on base to sling that wildly moving sinker, and hope to get a double play from aggressive hitters hoping to drive in some runs. Now that walks were so much more catastrophic in the closer role, he was aiming it instead of winging it and became more hittable and just as inaccurate. I don’t get how our team seems to strike out a ton against the really hard throwers, but our hard throwers except Strasburg & Max never seem to strike many guys out?? Maybe the true stats are different than what I think I’m seeing. (As Todd often points out to me.) But on that count, Kelly seems like the only reliever who can actually swinging K a guy when he needs one. Ross threw 150 innings in 2015 and was above 120 last year when you include his rehab assignments. I don’t think they’ll peg any innings limit this year to last year’s total after he threw more innings the year before. So I don’t think he’ll be limited to 130-35 innings this year. I expect they’ll let him get to 175-180 if he’s healthy all year. You’re right, Ross did have rehab assignments last year, getting him to a total of 120 IP. But he’s coming off an arm injury last year. I really don’t think they’ll push him beyond 150-160, coming off injury and in his age-24 season. The problem with keeping Turner and DFA’ing Romero is that it leaves them with Perez as the only lefty in the pen. Meanwhile, Neal Cotts has righted the ship after one horrendous outing. He has allowed only one baserunner (a walk) over his last 4 outings (5.2 IP). I don’t know if Cotts has an opt-out date on his contract, but given the shortage of MLB quality lefties in the organization they probably don’t want to lose him. If Turner stays, maybe Treinen will get sent to Syracuse for awhile to clear his head. Karl, not a bad idea. maybe Romero’s fate is not sealed until Solis comes back. Where is Matt Grace? Why do we not consider him as an option? Right now his ERA in 8 innings is bad but he’s got a 10/1 k/bb in AAA and his 2016 numbers were solid for AAA. What does he have to do to get a shot? Solis went on the DL on 4/19 so could come off on Saturday. Romero had two good outings against the Mets over the weekend so won’t feel the axe right away. Treinen has struggled more consistently than Romero has. In general, I agree that Treinen isn’t as bad as he’s looked, he just got put in a role he’s not wired for and it short-circuited him. Have not heard any word on how Solis is doing, though he hasn’t been in any rehab games yet. Given his history, we might not see him again for months. The way Dusty was talking they’re going to keep Romero around. Rizzo loves these type of guys and a pitcher, any pitcher, looking bad in Colorado is not news. Let’s see what kind of shape the bullpen is in when they get back home to play NY. Sure glad we’re getting this lone trip to Colorado out of the way early. BTW- Kudos to Todd for this post, Turners start ctried out for a Todd Boss post! Forget the bullpen, just outscore ’em! Yep, *very* good to get the trip to this funhouse of pitching horrors out of the way now. Nats are now 7-1 on what looked on paper to be a dangerous early-season road trip. As is traditional, jumping to conclusions is what we do best. The answer to most every expression of hope (Zim! Jacob Turner, Neil Cotts) and concern (Rendon, bullpen) is “April.” I would hope that, for the Nats’ management, a handful of at bats or innings pitched is the last, least data that they consider in making their decisions. FWIW, Kelley gets a ton of whiffs. Albers might turn into a pumpkin (insert fat joke here) – but we thought the same thing about Belisle last year, and he was really effective in that role. JohnC: well, what else are we going to talk about? Seriously. The team is 14-6. They just swept their only divisional rival in their house, beating two of their three best pitchers. We’re seeing (so far) a very promising bounce back to 2015 season start from Harper, a possible career revitalization from Zimmerman, continued excellence from Turner, continued dominance from Murphy, and expected production from Eaton. Even Wieters is more than holding his own (> 100 OPS+). The starters have been great. Outside of one Guthrie start, the rotation has been fantastic. Even with that awful start they’re 2nd in FIP and 1st in fWAR. Without Guthrie’s start the rotation right now has a 2.88 ERA for the year. That’s fantastic. I realize fully that I have a tendency to only post about stuff I want to complain about. But I was thinking the other day, man I need to post a post about how awesome they are right now. A cycle, perhaps? That’s definitely the Trea who some were predicting might be an MVP candidate. The Rockies are probably believers. On the bullpen, collectively, based on track records, it’s a talented group, one of the best sets that the Nats have ever had. We’ll see. It’s definitely too early to do anything rash. I keep telling people to look at what Albers did 2012-15, with MLB ERAs of 2.39, 3.14, 0.90 (SSS), and 1.21, with correspondingly good WHIPs. On Turner’s cycle; just the 3rd in Nats history (i.e. from 2005 onwards, sorry to die hards who want to include Montreal in our “history”). I’ve got a big running “Best games/Worst games” post that I revisit periodically and where I keep track of cool stuff like this. I have Tanner Roark in fantasy; do I dare start him tonight? I mean, Colorado is just ridiculous. Roark might give up 5 in 5 and still get the win but destroy my ERA. I’m confident Treinen will right the ship and be slightly better than the 2015 version of Treinen, and slightly worse than the 2016 version. He shouldn’t be the “closer” for a few reasons: (1) he doesn’t strike people out; and (2) he’s a good option to come in with men on base; and (3) he can go more than one inning. All of this was true before his recent struggles – he never should have been named “closer” in the first place. I’m a bit more worried about Blanton, for one good reason and one bad one. The good reason is that he’s several years older than someone like Treinen (with a lot more miles on the tread), so it’s not outside the realm of possibility he’s at the beginning of the end. The bad reason is that the deep pocket Dodgers who had him last year didn’t re-sign him. Maybe they know something we don’t? The rest of the pitching issues (including Joe Ross), I chalk up to “Coors Field” and expect they’ll be fine. I also note that it’s far more important for the bullpen to pitch well against the Mets (as they did last weekend) than it is for them to pitch well against the Rockies. Finally, if we say “April” or “small sample size” in response to bullpen struggles, we have to say the same thing about our hitters who are doing well. Harper and Murphy have recent enough track records to suggest their performances are real, or real enough. My heart very much wants April 2017 to be the beginning of the Ryan Zimmerman Redemption Tour, but my head says we need a few more weeks to get really excited. Finally, finally, Todd I have one small nit to pick: Matt Harvey is NOT a frontline pitcher anymore (I assume you had him as one of the Mets’ three best pitchers; I think Matz has passed him – when healthy of course – and maybe Wheeler too). Harvey is striking out just 6 per 9, and currently BABIPing .203 (in front of a grotesque defense). Thoracic outlet surgery is a BIG deal – the number 1 success story for that procedure is Jaime Garcia. I don’t care that his velo is back – he’s not missing bats. I predict ERA in 2017 will end up much closer to his 4.88 FIP than his 2.84 ERA. My opinion on Harvey; fair enough. I should have written that sentence as “The Nats just beat the Mets’ #2, #3 and #4 starters.” Because that’s true: they line up Snydergaard, deGrom, Harvey, Wheeler and gsellman right now. – 2017: on the D/L with elbow inflammation. So since being drafted in 2009, he’s thrown a grand total of 168 MLB innings and 380 minor league innings. that’s an average of 60 innings a season. I just don’t know how you can claim Matz is better than anyone when he’s hurt so often. 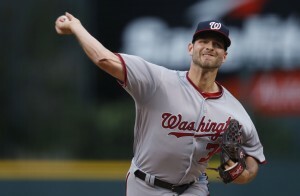 In his 132 innings last year he had a 3.42 ERA, a 3.39 fip, a 119 ERA+. Ok that’s good but not awesome; it would have ranked him 30th in the majors last year, right with Ian Kennedy, Bartolo Colon, and John Lackey. So, 3rd starters who had a good year? Harvey, meanwhile, was literally the best pitcher in the game or darn near close to it until his elbow injury. In 2013 he simultaneously led the league in fast ball velocity and was 3rd among qualified starters in K/BB ratio. Think about that combination together for a moment. He was just so awesome. And his comeback year in 2015 wasn’t half bad either. Now? I agree his peripherals in 2017 so far are awful. I understand its a different injury than TJ. So we’ll see. I don’t classify him as an Ace any more in the grand scheme of things; in fact in my rotation rankings I have both harvey and Matz as “league wide #2s” for now. I’ll revisit after the season though; if he’s done, it’ll be apparent and quickly. There’s no debate here that Harvey has had a better career than Matz and was better in 2013 than Matz will ever be. 2013 Harvey was about as good as a non-Kershaw pitcher can be these days. The 2015 version of Harvey was also quite good, also perhaps better than Matz will ever be. The issue I’m interested in is who’s better now and who’s likely to be better going forward. I’m extremely confident the 2013 version of Harvey is never coming back and quite confident the 2015 version isn’t either. I think the numbers support the conclusion that Harvey is a 4.00 ERA pitcher going forward, much more like a league wide #5 than a league wide #2. His current 2.82 ERA is a mirage – his reputation for excellence far outstrips his actual current ability. I don’t think he’s done as a pitcher, he’s just done as a top line guy. Unlike Harvey – who has problems with performance and staying on the field – Matz just has problems staying on the field (notwithstanding his history, he threw a lot more innings last year than Harvey). I’d put Matz in the solid #3/upside of a #2 category, below deGrom and well below Syndergaard. Harvey is on the market after next season. Talk about damaged goods that could give out at any time. Ol’ Scotty Boras will definitely have to get creative in how he markets him. I would think that the contract would have to be heavily incentive-based and probably no longer than three years. Speaking of contracts, JZim now sports a 6.35 ERA and 1.588 WHIP after giving up 5 over 6 IP last night (and getting the win!). Verlander’s ERA is 6.04, WHIP at 1.522. Think the Tigers might wish they had ponied up for Max instead? I had just noticed today that he was leading the team in appearances with 11, and was thinking that Dusty’s tendency to really ride those bullpen arms he trusts was going to get him hurt. I was also wondering if Dusty is trying to send Rizzo a message that it is time to cut bait on Perez since he’s only used him 5 times so far, the same number of times as Fat Albers, who joined the team a week into the season. In any event, how long can possibly they carry two LOOGYs on the roster? I’m going to take the glass-half-full approach and say that this is a chance to rest Glover’s arm now so it’s healthy later. It’s concerning that the hip pain has returned, though. Karl, I don’t trust Ollie any more than you do, but he did get it done last night. Can’t say the same for Treinen. Sorry John, but I stand by the “short-circuited” comment. He’s a very good pitcher, but currently one who can’t trust his stuff and can’t get it done right now. Todd, good call on the Grace resurrection. Meanwhile, they’re 8-1 on the trip. Wow. As I’ve said several times, you can’t win the pennant in April, but you can lose it. The Mets, who had an easier April schedule than the Nats, are now 6.5 games back and facing a trip to Nats Park. Let’s drive the stake in while we can, guys. This Turner kid might turn out to be pretty good. He’s also controlled for five more years. I like Perez and wonder if he’s not the defacto “long man” on the staff, with the added benefit that he’s lefty and can do one out. What are the odds that i’d call Matt Grace as the call up? low, i tell you. I’d have called up Adams. Not quite believing what I’m seeing out of this team to be honest. You hope for a .500 record on road trips, sneaking a series win here and there, not sweeps. And not beatdowns of 1st place teams (whether or not you think Colorado is a paper tiger or not). Great to see. – He has a .370 Babip this year, .388 last year, and it was at least that high for the duration of his time in the minors. – He’s top 10 in Line Drive % right now (along with Dave Murphy) at 32%. Great combination of quantitative points on Turner. He’s a machine. When you see Turner hitting oppo-boppos, that’s when you realize just how great he has the potential to be. How often is it that the fastest guy in the league (maybe 2nd behind Hamilton, but still) has that kind of pop as well as an excellent eye for the strike zone? The Rockies have to be thinking to themselves how glad they are that the Padres are run by a bunch of dunderheads, and that as a result they’ll only face Turner 6-7 times a year instead of 19. KW — there is no silver lining in Glover’s injury. It’s his hip, which he had surgery to fix just this past offseason. For it to be knocking him out of action again so soon is not a good sign. Even if he avoids having surgery again and tries to treat it with just a couple of weeks of rest, it could crop up again at any time. What it means for the Nats is now they are going to have to soldier on without the only reliever who was on the opening day roster whose ERA is currently below 5.00. I did a double-take when I saw that Trea’s prorated HRs over the full 2016 MLB season would have been 29. His max HR level coming up was projected to be 12-15, and some thought that was pushing it. He may end up being the best overall player from the 2014 draft. But if he was a Latin player, would anyone have even signed him at 16 or 17? Both Glover and Dusty are saying “just precautionary” on the hip. Hope they’re right. (3) good luck, since I don’t think he’s going to sustain a BABIP of .438 (career .311) or a HR/FB% of 34.8 (career 13.8). (1) and (2) should keep Zim from completely falling back to Earth even when (3) normalizes. In three and a half weeks, Zim’s 1.3 WAR (both fWAR and rWAR) is already his best season by WAR since 2013! Actually, my bad. It had been initially reported last winter that Glover was going to have surgery, but I just read where he opted for physical therapy instead. Hip injuries are nothing to screw around with. My wife is an equestrian and was having severe hip pain for about a year from a torn labrum (exactly the same injury Glover has), and it didn’t improve until she finally had the arthroscopic surgery. Glover and Dusty can sound optimistic all they want, but it sounds to me like he should have gotten the surgery right away. It’s also impossible for us to know just how screwed up Zim was health-wise. He started with the cortisone shots in the shoulder in 2012. Boz keeps insisting that health is the biggest reason for the turnaround. There are definitely some quantifiable things involved as well, though, including “luck” (BABIP). But it’s well past time for luck to run in his direction, don’t you think? And Lord knows the “luck” and the health are helping rebuild his confidence. Is this a lucky month, a career revitalization, or somewhere in between? All I know is that the lineup suddenly looks a whole lot different with Zim locked in and Trea back. I’ve been extra busy this week, so these things may have popped up elsewhere in the Natosphere, but I’ll mention them here while I’m thinking about it. First of all, Jim Bowden was one of the hundred or so who got the axe from ESPN, along with long-time baseball guy Jayson Stark. We forget just how good Ankiel was as a pitcher when he first came up. He looked like he was going to be one of the best there ever was. KK, I love me some Trea Turner, but I don’t think he can be fairly described as having an “excellent eye for the strike zone.” He has a career 4.4 % walk percentage and 19.9 % K percentage. The latter is not good but it’s not bad (Murphy is 11.8% – excellent – for his career, Harper is 19.2%, to give you some data points). His BB% is exceptionally low (Bryce, of course, leads the world in this category). Of the 268 players who got >300 plate appearances in 2016, Turner ranks 25th from the bottom in BB%. Michael A. Taylor owns a higher career BB% than Turner! He was in the bottom third of the league last year in O-Swing % (percentage of pitches outside the strike zone swung at) – again, worse than Michael A.
There’s reason to think he’ll improve – he ran higher BB rates in the minors and 2016 was his first go around in the majors. Trea Turner is good or excellent at many many things a baseball player needs to be good at to succeed. His eye for the strike zone, so far, is definitely not one of them. Developing strike-zone judgment, abject fear of walking him, or both? Definitely both. He’s much closer to the bottom in terms of BB% than his in terms of O-Swing%. This suggest to me that the lack of walks is not entirely because he’s swinging at pitches outside the zone. The most obvious explanation for this is that he’s seeing a lot of strikes, which keeps his BB% low. He was in the top half in terms of zone percentage (percentage of pitches inside the strike zone), but not in the top third (note: Bryce was second from the bottom, just ahead of David Ortiz). I think this is because pitchers don’t want to walk him because of his speed. My guess is he’s not near the top in terms of zone percentage because of his strike zone judgment – he’s shown a willingness to swing outside the zone. It looks to me like his bat control allows his to get enough wood on the ball hitting it into the ground and using his speed to get base hits when he might have otherwise worked the count and walked. But the fact that he walked at double his current rate in the minors is an indication that his strike zone judgement is better than his current stats would indicate. Wow, just wow. Hope most of you got to see the 11-run inning. Right now, this is an amazing hitting/starting pitching machine. The Nats went 9-1 on the road trip, including 3 of 4 at the West-leading Rockies. The Mets are now 7.5 back and in last in the East. I’m going to assume that they’ll come into DC feeling like they’re fighting for their season, although it sounds like Cespedes may be headed to the DL. The Nats can’t take their foot off the pedal, though. The negative footnote is that Blanton got bombed again, ERA now 11.00. I was excited when the Nats signed that guy. I had actually forgotten before the spring that they had signed Albers (ERA 0.00). KW — Being recently retired I did see that incredible 11 run explosion. The whole series reminded me of when the wife and I visited Denver on opening day back in 2005 (back before they started using humidifiers on the balls), and saw a 14-11 slugfest that looked like a video game. The difference this time is that a lot of the Nats’ XBHs were really driven and looked like would have been so anywhere. And in the 9th inning it looked like they were going to need all those extra runs. Blanton is a complete disaster right now, which they can ill afford given Glover’s injury and Treinen’s own woes. He’s been scored upon in 6 of his 9 outings this year and his ERA against Colorado was a cool 54.00. How much longer can they go without DFA’ing Blanton or sending Treinen back to AAA for awhile? I doubt the Nats will eat the $4M owed to Blanton. It sure would be convenient if he and/or Treinen would strain a hangnail or something, though. As it is, the Nats do still have Jacob Turner on the 25-man, so it will be interesting to see if he starts getting some bullpen appearances. As Todd keeps pointing out, they’ve also got one guy looking great at Syracuse, Austin Adams: 0.82 ERA, 1.00 WHIP, 17 Ks in 11 IP. (Not a bad return for guy who is hitting .195 and leading the AL in Ks. We don’t miss you, Danny!) Cotts gave up five runs in one outing to ruin his ERA but has had six scoreless appearances since then. How many Nat relievers have had six straight scoreless appearances? Then there’s the offense. The team OPS is .842. For reference, Wilson Ramos’ OPS in 2016 was .850. I know it won’t last the whole season, but it’s pretty amazing right now. Keep the pedal to the metal. No mercy on the wounded Mets. KK – agreed that TT has excellent bat control. He makes a lot of solid contact when he does make contact. I do hope his plate discipline improves (I think it’s really the only thing he’s lacking at the moment). I expect that it will – the questions are by how much and whether improving in that area will affect his performance in other areas (being more selective could lead to fewer XBH in addition to fewer Ks and more BBs)? If he is able to keep up his current profile and adds even league average plate discipline to it, he’s a perennial MVP candidate type, IMO.